Mattis’ concept of strategic reliability is an appropriate frame to examine the future of U.S. seapower in the Indo-Pacific. America’s rise as a naval power was predicated on the ability to form alliances and partnerships with nations that believe cooperative maritime security benefits common interests and enhances regional and global stability. The backbone of these alliances and partnerships derives from a fundamental belief in freedom of the seas, a central tenant of the international rules-based order, to which the former Commander of the Indo-Pacific Command Admiral Harry Harris said “ensures all nations, big or small, have equal access to the shared domains.”2 Since the fall of the Soviet Union, in what the late Charles Krauthammer described as “America’s unipolar moment,” U.S. seapower, along with the alliances and partnerships that bolster its preeminence in the Indo-Pacific, has largely gone unchallenged.3 However, with a rising China and its focus on building its own world-class, blue water navy, the future of U.S.-led, cooperative maritime security in the Indo-Pacific cannot be taken for granted. The underlying question is can U.S. seapower with its existing framework of maritime alliances and partnerships remain the leading guarantor of Indo-Pacific maritime security, or will China take on that role? The collective wisdom is that the U.S. Navy will continue to lead and foster cooperative maritime security efforts in the Indo-Pacific, but only with a careful reexamination of how the U.S. projects its seapower and postures itself in a new era of great power competition with China. With the presence of the U.S. Asiatic squadrons in the 19th century, the U.S. Navy made its debut in the Indo-Pacific region. Like most global navies, the U.S. Navy emerged in the region to protect and promote America’s growing interests in commercial trade and diplomatic relations. From the U.S. Navy’s debut in the region, alliances and partnerships helped bolster and sustain U.S. seapower in the Indo-Pacific. Those alliances and partnerships were cemented with the spoils of victory in World War II, with the establishment of U.S. naval bases and forward operating locations throughout the region. Today, the U.S. Navy enjoys unprecedented access to the Indo-Pacific region, with naval forces forward or rotationally deployed in Guam, Japan, Korea, Okinawa, and Singapore, and visiting force agreements in the Philippines and Australia. 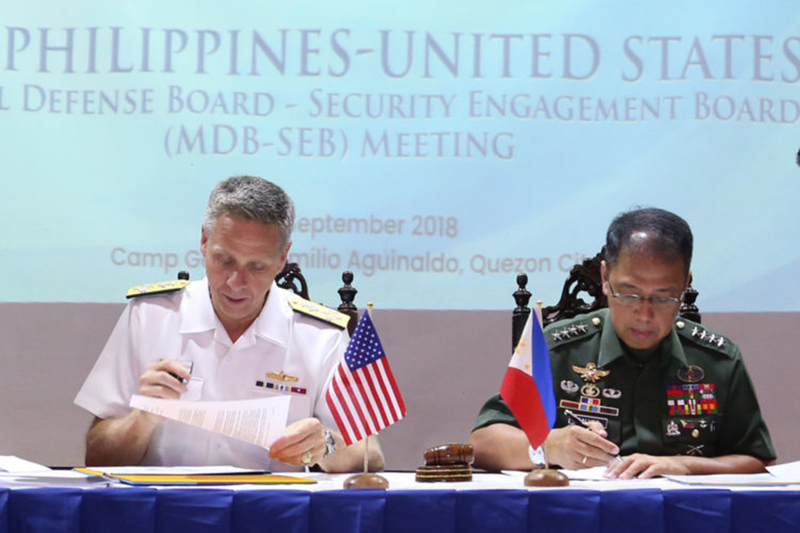 This access enables the U.S. Navy’s power projection in the region and yields opportunities for the U.S. to play a constructive role in strengthening cooperative maritime security networks by, with, and through the assistance of allies and partners. A rising Chinese maritime power harkens to the realities of geo-strategic position. The U.S. Navy serves as a mostly non-resident, yet established maritime power in the Indo-Pacific while China is embracing its role as the resident, emerging maritime power. Against the backdrop of the routine presence of the U.S. Navy across the Indo-Pacific, nations are increasingly hosting the People’s Liberation Army-Navy (PLAN) in their waters and ports. The PLAN is growing rapidly as a regional maritime powerhouse and blue water navy, and nations in the Indo-Pacific know they must cooperate and work with their Chinese neighbors at sea to maintain cordial and friendly relationships with the fledgling superpower. 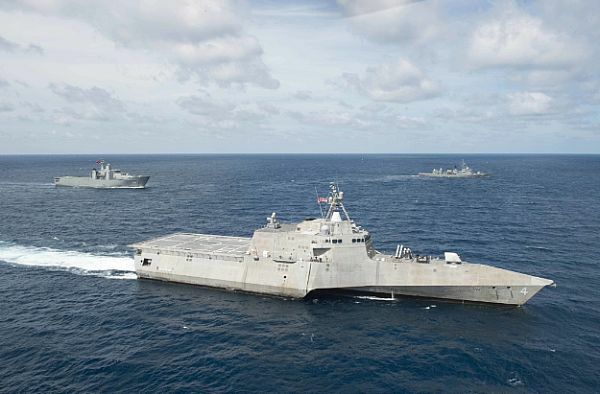 Despite the emergence of China as a rising maritime power, the U.S. still embodies its role as the principal leader of cooperative maritime security in the Indo-Pacific region. The U.S. Navy facilitates multilateral, cooperative security engagements such as Rim of the Pacific (RIMPAC), Malabar alongside the Japanese and Indian navies, and Southeast Asia Cooperation and Training (SEACAT) that enables the U.S. to operate with ASEAN and South Asian partners such as Sri Lanka and Bangladesh. When manmade and natural disasters afflict the region, nations in the Indo-Pacific frequently request the assistance of the U.S. Navy in relief operations such as in the Philippines after Typhoon Haiyan in 2013, the search and rescue of Air Asia Flight 8501 that crashed into the Java Sea in 201, and more recently to assist in flood relief efforts in Sri Lanka in 2017. The U.S. Navy should use its credibility in the Indo-Pacific to advance the National Defense Strategy that advocates for strengthening the U.S. network of alliances and partnerships through “mutually beneficial collective security,” “reinforcing regional coalitions and security cooperation,” and “deepening interoperability.”14 Indo-Pacific nations have no choice but to cooperate with China as the emerging, resident maritime power, but that doesn’t diminish the U.S. Navy’s role in the region. In fact, fears of how China is using its rising maritime power may even strengthen it. Despite its strong regional security networks and amicable relations with allies and partners, the U.S. Navy cannot take its status quo for granted. An easy assumption may be that maritime alliances and partnerships can endure through periods of non-engagement when priorities for naval platforms and people are needed for other pressing operations. This would be a strategic mistake for the U.S. in an environment where China is eager to fill even the smallest void left by the U.S. Navy’s competing priorities. Consequently, U.S. strategic choices in projecting routine naval presence and its investment in long-term military relationships correlate directly with Mattis’ concept of strategic reliability. On the operational and tactical levels, this translates to meaningful and routine maritime security cooperation where relationships form the foundation of trust for the alliance or partnership. Every time the U.S. Navy conducts a security engagement or exercise with its allies and partners, it sends a strategic message that aligns with America’s stated commitments to the Indo-Pacific. Moreover, in the age of tweets and 24-hour news cycles where organizational memories are short, the Navy’s engagement with allies and partners must be routinely executed to demonstrate U.S. resolve and commitment. Rest assured, U.S. friends and allies will take note of how it postures its seapower and forward presence to match words with deeds. What could marginalize U.S. Seapower in the Indo-Pacific? After at-sea collisions by USS Fitzgerald near Japan and USS John S. McCain in the Singapore Strait, China took full advantage of the disarray and characterized the U.S. Navy in its state-run press as dangerous and undependable for Indo-Pacific nations.21 The U.S. Navy cannot be everywhere, and it certainly is not immune to accidents, but the solution to restoring any lack of faith in U.S. seapower in the Indo-Pacific is to remain engaged and double down on the U.S. commitment to free and open seas and regional stability by way of its alliances and partnerships. William Choong, Senior Fellow for Asia-Pacific security at the International Institute for Strategic Studies (IISS), posits that “Southeast Asian countries usually prioritize economic development over U.S. military presence in the region” as means for advancing their upward economic mobility.22 This trend in the region will continue and China is equipped to assert its economic leverage through ambitious programs such as the One-Belt, One Road initiative, which could be a potent undercurrent in nations’ decisions to engage with the U.S. in the maritime security sphere. The U.S. Navy possesses adequate technology, diverse naval platforms, and perhaps most important, the creativity and ingenuity in its people, to remain relevant and engaged with allies and partners across the Indo-Pacific and retain its principal leadership role. Yet with the realities of great power competition, skepticism will not cease completely, and tepid or inconsistent engagement will cast doubts of U.S. resolve. In essence, any marginalization of U.S. seapower in the Indo-Pacific will be a strategic choice, not a preordained destiny. The National Defense Strategy contends the U.S. military must “outthink, out maneuver, out-partner, and out-innovate” America’s adversaries and competitors.24 In this vein, practical considerations for cooperative maritime security engagement should be considered carefully. The U.S. Navy must continue to demonstrate credible, lethal, and distributed seapower.25 This must be accomplished using the full breadth of naval power and associated platforms that can operate adeptly in the littorals, global commons and in contested grey zone spaces. Lastly, the U.S. Navy should seek more opportunities to work jointly with other U.S. military services during cooperative security engagements. 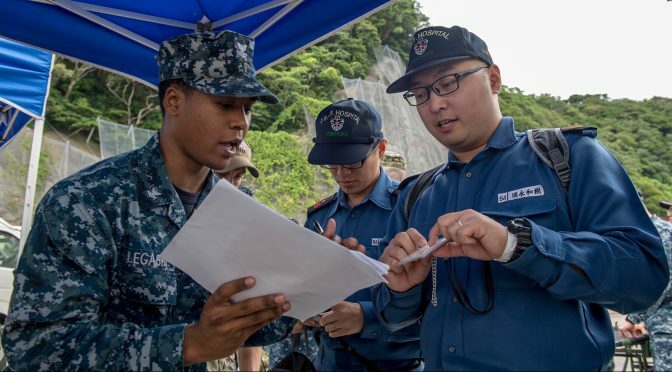 Partnering with other U.S. services, including the U.S. Coast Guard, increases opportunities, scope, and the quality of engagements with allies and partners while prudently managing finite resources in manpower and available platforms. Wylie’s view of cumulative operations provides a suitable template to assess the value of cooperative maritime security engagements across the Indo-Pacific. Engagements large and small all matter when assessed holistically and contribute toward the greater goal of advancing U.S. interests and strengthening seapower. More importantly, the cumulative effect of sustained U.S. naval presence and engagement sends an important message to allies, partners, and adversaries alike that America is an Indo-Pacific maritime power that remains committed to its role as the principle guarantor of regional stability. China’s rising maritime power should not threaten U.S. maritime superiority. U.S. seapower will only be marginalized by inaction induced by lack of will or by strategic choice. While both the U.S. and China have an important role to play in preserving peace in the Indo-Pacific, the U.S. Navy is uniquely positioned to remain a regional leader of cooperative maritime security due to the values it promotes and the stability it underwrites through sustained naval presence. Competing operational priorities and finite resources are a reality for a forward-deployed maritime power. Yet these challenges should not deter routine security cooperation with allies nor should it equate to neglect of smaller, less strategic maritime partners. China’s growing economic influence, sometimes coercive in nature, also raises doubts about the sustainability of U.S. alliances and partnerships. The future of U.S. seapower in the Indo-Pacific remains viable so long as it remains embedded in the alliances and partnerships that sustain it. This requires routine naval presence, reassurance when necessary, meaningful military relationships, and as Secretary Mattis suggested, these actions culminate in strategic reliability. In this frame, U.S. seapower in the Indo-Pacific remains as relevant today as it ever was. Lt. Commander Arlo Abrahamson is a career public affairs officer with the U.S. Navy and current graduate student at the U.S. Naval War College in Newport, Rhode Island. 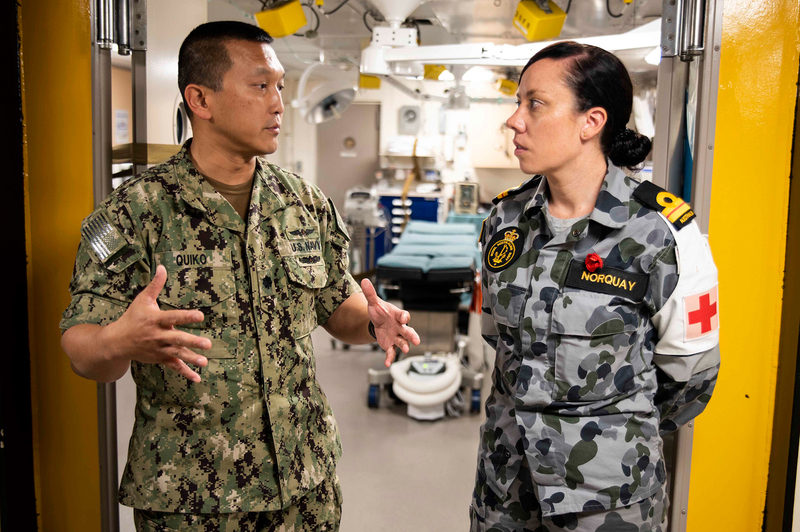 He has served operational and staff tours in Japan, Korea, and Singapore with the U.S. 7th Fleet operating as a spokesperson for the U.S. Navy while supporting major exercises and security cooperation engagements across the Indo-Pacific. Abrahamson holds a Masters Degree in Mass Communication from San Diego State University. 13. Dr. Collin Koh (Rajaratnam School of International Studies RSIS), email correspondence to author, Sept 21, 2018. 14. U.S. Department of Defense, U.S. National Defense Strategy, Washington, D.C.: Secreatary of Defense, 19 Jan 2018. 15. Edward Luttwak, “Political Uses of Seapower,” Studies in International Affairs (The Johns Hopkins University Press), 23 (1974). 16. Richard Fontaine, “Networking Security in Asia,” The Washington Quarterly, Vol. 40, No. 3 (2017), 45-62. 19. Dzirhan Mahadzir (Maritime Institute of Malaysia), email correspondence to author, 22 Sept, 2018. 20. U.S. Navy, Comprehensive Review of Recent Surface Force Incidents, March 2018, accessed 19 Sept 2018, https://www.public.navy.mil/usff/Pages/usff-comprehensive-review.aspx. 21. Hueling Tan, “USS John McCain collision met with applause in China, state run media reports”, CNBC.com, 21 Aug 2017, accessed 26 Sept 2018, https://www.cnbc.com/2017/08/21/uss-john-s-mccain-accident-created-applause-chinese-state-media.html. 22. Dr William Choong, email correspondence to author, Oct 20, 2018. 23. Dr. Collin Koh (RSIS), email correspondence to author, Sept 21, 2018. 24. U.S. Department of Defense, U.S. National Defense Strategy, Washington, D.C.: Secretary of Defense, 19 Jan 2018. 28. Adams, Gordon, Murray, Shoon, Mission Creep, The Militarization of Foreign Policy? (Washington, D.C.: Georgetown University Press, 2014). 29. J.C. Wylie, Military Strategy: A General Theory of Power Control (Annapolis: Naval Institute Press 1989), 22. 30. U.S. Department of Defense, U.S. National Defense Strategy, Washington, D.C.: Secretary of Defense, 19 Jan 2018.